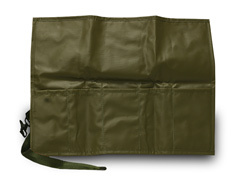 Tool Roll Features 5 pockets w/ heavy webbing & Buckle closeure. Made of very durable and water resistant 18 oz PSY Vinyl Coated Nylon OD. © ESTEX MANUFACTURING COMPANY INC.
View our videos on YouTube!